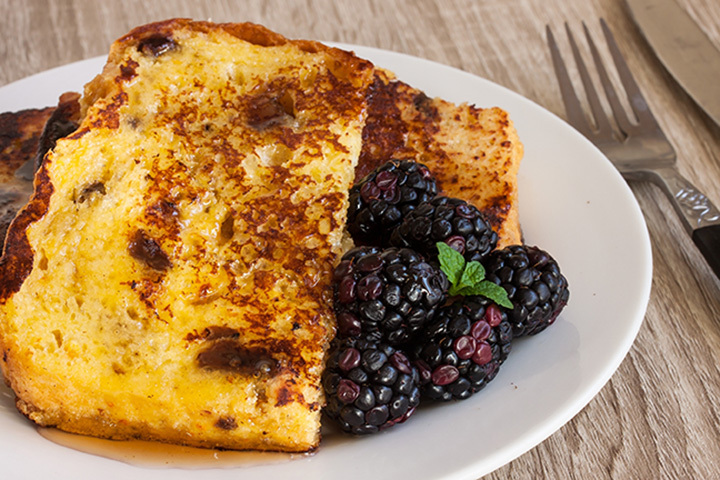 French toast—this delightful food is delicious any morning of the week. What makes great sense is that the French influence on the cuisine of Louisiana isn’t just for the savory dishes that are so well known and popular. The French toast is spectacular as well. At these amazing places around the state, you can find traditional French toast or specialty dishes that include fruit, whipped cream, butter, and sometimes alcohol. Here are our 10 favorites! When Jimmy J’s Café in New Orleans opened its doors in 2011, they were on a mission to provide made-from-scratch food that tasted great at great prices. Mission accomplished according to social media sites, popular demand, and word-of-mouth by satisfied customers from all over. Some people even equate their dining experience with a heavenly one. It could be that they’ve tried the blueberry brandy glazed French toast or the pineapple rum raisin French toast. That would explain why so many people leave the restaurant with smiles. Stop by and order your favorite or discover a new one any day of the week starting at 7 a.m. Simple and uncomplicated. Just the way breakfast should be. Whatever you love to eat for breakfast, you can find it at Christina’s Restaurant conveniently located in downtown Baton Rouge, Louisiana. Providing great home-style cooking with daily specials for over 20 years, Christina’s is open every day but Sunday, and offers eggs with regular or country ham, steak, bacon, sausage, chicken fried-steak, and pork chops, biscuits and gravy, sandwiches, pancakes, omelettes, and French toast. The food is so good, you might just stay for lunch. This is American food done right, at least to Louisiana standards of fine food excellence. Southside Café in Slidell gives you friendly and fast service so you can start enjoying your choices and satisfy your hunger. Originally opened in 1991, the restaurant saw years of success until nearby Lake Pontchartrain flooded through its doors during Hurricane Katrina. After a few months to rebuild, the eatery once again opened for business, only to be completely destroyed by a fire. The owners did not let them keep them from forging on with determination to bring great food and service to the good people of the area, and in 2006, the doors opened again. Never give up is the motto they live by, and that includes never giving up on the good food and good people who want to serve you here. Casual and laid back, you’ll find popular lunch sandwiches like the Peacemaker made with oysters, fried eggs, smoke Applewood bacon, cheese, lettuce and tomato on French bread or a popular breakfast item. Meat pies and wiener wraps are curious menu items, but no one does them better than Jo-Bob’s Gas & Grill. Located in Grand Isle, Louisiana, Jo-Bob’s also offer boudin bites, a particular taste treat original to the Southern culture found in the state. If breakfast is more to your liking, they have traditional favorites like eggs and sausage, ham, and bacon, biscuits and gravy, and French toast sticks. A popular place for families with little ones, Jo-Bob’s is open every day at 5 a.m. The year was 1894, and the Old Coffee Pot Restaurant was a new restaurant in downtown New Orleans. Offering traditional creole, Cajun, and special house favorites for breakfast, lunch, and dinner, the Old Coffee Pot is a trusted source for good food and good service. You can have something simple for breakfast like yogurt and granola or start your day with a special Banana Foster French Toast. With a variety of egg dishes, you’ll only have the problem of deciding which one to try first. Open every day at 8 a.m., you can also find vegetarian menu items. With a special flare for dramatic pairings, you’ll never get bored with the choices at Brennan’s in New Orleans. A dining tradition since 1946, if you ask anyone in the city where to eat breakfast, they’ll tell you Brennan’s without batting an eye. Known as a New Orleans institution for all things food, you’ll find creole-inspired dishes like fried rabbit with creamed collards, eggs over easy, and pickled port, Vanilla-scented French toast with strawberry and rhubarb compote and Devonshire cream, and some of the best cocktails around. This award-winning restaurant is open daily, and is endorsed by Southern Living Magazine, the New Orleans Advocate, Thrillist, and New Orleans Magazine to name a few places. If the sound of Praline bacon and Cajun Eggs Benedict sounds intriguing, try The French Press in Lafayette, Louisiana, for breakfast. This casual family establishment is open seven days a week for breakfast and lunch. Featuring a breakfast sandwich that will knock your socks off with eggs, avocado, bacon, tomato, spicy chipotle aioli, and cheese served on a warm buttered croissant and potatoes or grits, you might try the cream cheese and banana-filled French toast with berry-champagne compote for a lighter and sweet start to your day. Either way, you won’t be disappointed. Creamy buttery grits, biscuits stuffed with scrambled eggs and bacon and covered with sausage gravy and cheese, and powder sugar sprinkled French toast are just a few of the breakfast items available at Lea’s in Lecompte, Louisiana. Located in the northern part of the state, this little diner is also open for lunch every day. Open since 1928, Lea’s is a tradition among the locals and a great repose for travelers passing through. In spite of the modest surroundings, the restaurant has been featured on television, in popular publications, and as part of food tours. Breakfast with a twist is what you’ll find at the Bentley Room in Alexandria, Louisiana. Imagine a mouthful of warm and cheesy smoked Gouda grits or the taste of blueberry Bourbon oatmeal with a side of strawberry basil jam on your toast or bagel. Or if you’re a traditionalist, you can build your own omelet or order the French toast topped with powdered sugar and fresh berries. Whatever you try, you’ll be glad The Bentley Room was built in 1908, and has continued to offer extraordinary food for breakfast, lunch, and dinner made by dedicated chefs. Open daily from 7 a.m. until 2:30 p.m., you have to try the Rainbow Toast when you stop by First Watch in Shreveport, Louisiana. Made with fresh blackberries, blueberries, strawberries, mango, and an in-restaurant made granola on a Ricotta-covered brioche toast drizzled with honey, you’ll think you’re in French toast heaven. They also have Million Dollar Bacon for those with unlimited budgets, and egg-clusive dishes featuring bacon, chicken, turkey, or pork sausage, and artisan breads. Vegan and vegetarian friendly.